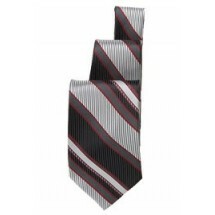 Keep your staff looking sharp and professional in the Chef Works TPST Black/Silver/Burgundy Striped Tie. 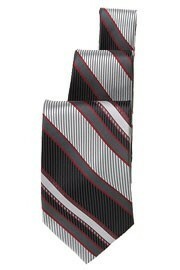 Boasting an attractive woven multi-stripe pattern, this tie can be mixed and matched with any basic uniform. For outstanding durability, this wrinkle-resistant polyester tie needs special care and must be dry cleaned only.